This has been a long week. A sorrowful week. So much so that I considered skipping this week’s Feel Good Friday. But, what changed my mind was Feiden Santana. The young man that was not only brave enough to tape a vicious assassination from someone in authority, but release it to the victims family. To tell the whole cruel story and bring swift justice at the same time. The other name you might not be familiar with; Oyekoya Yemi. A Nigerian man that is also fighting against an injustice in his backyard. Instead of a camera, he’s using a bicycle. 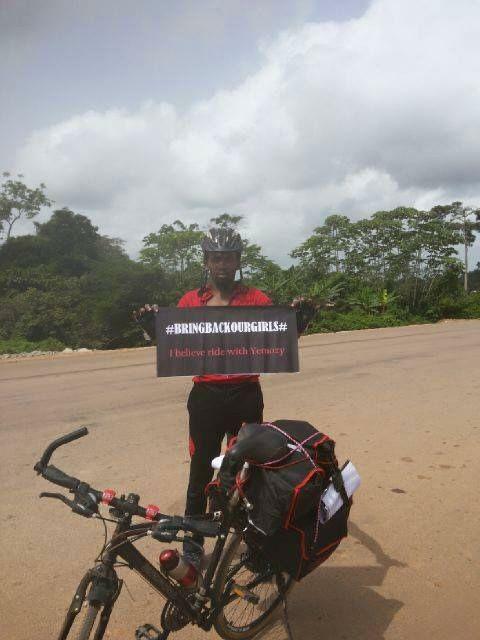 Yemi has challenged himself to make a 500 mile journey from Abidjan, Ivory Coast to Lagos, Nigeria on his two wheeler. All to raise awareness for the #BringBackOurGirls campaign. In three days it will be one year since 200 Chibok schoolgirls were ripped from their beds at school, and sold as child brides by the Boko Haram. Since that time the brutal terrorist group has merged with equally ferocious ISIS. I know what you’re thinking. How does this make me feel good? I’ll tell you how. Because no matter how bad things get or are. There is always someone fighting to make things right. And it’s people like Oyekoya willing to risk his safety and comfort for 15 days (he wraps up his tour next week) to make people remember. Our humanity. Follow him on Twitter as he chronicles his journey. This ride will be as emotionally draining as it is physical, but so worthwhile. Whatever is to be done to #BringBackOurGirls must be done! Despite all the bad swirling around us these days, there is still good. Good people too. So, let’s be thankful for that this week.